Well, whilst wandering through a Toys R Us I managed to finally find the elusive James from Team Rocket Pokemon trainer figure. Not only that but at a greatly reduced price, so much so in fact I was able to get the even rarer Brock figure! (Unfortunately I didn't realise until I got home that my James had come with Arkob instead of Koffing, but nevermind). After these great finds though I stumbled upon the subject of todays dissection. Lego Technic Bionicles. Once a paradise, Mata Nui has become a place of darkness and fear, ruled by the deadly Makuta. Now six mighty heroes, the Toa, have come to gather Masks of Power and challenge Makuta. At the dawn of time the great spirit Mata Nui was sent down from paradise to care for all living things. He brought joy and light to the islanders known as the Tohunga (Our little chap is one of them!). The world was a joyful place, until Makuta, Mata Nui's spirit brother, secretly followed him from paradise (Boo hiss!). Makuta envied how the Tohunga worshipped his brother's goodness, so after a mighty struggle he cast a spell, which made Mata Nui sink into an endless sleep. But still the Tohunga would not worship Makuta. So Makuta brought dark places to the land where the Tohunga dare not go for all the wicked beasts, which Makuta did truly rule. 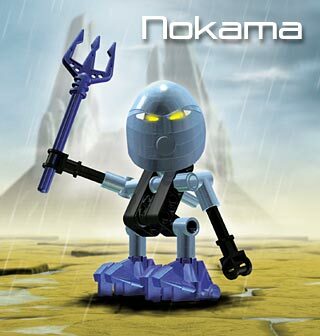 While Mata Nui slept, the Tohunga's powers and skills were weakened by Makuta's dark powers. 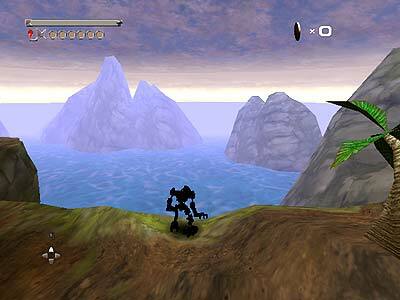 But the islanders kept faith in Mata Nui, and the Legends of The Bionicle, which told them six mighty heroes called Toa would liberate them from Makuta and his beasts and then pre-package them for mass consumption in large toy chains around the world. Okay so I added that last bit, but whoa! This has some serious back story and work gone into it. A bit more than Lego's normal fare of - they're pirates, they're the navy go for it. Here we have a dark god, priests, legends and heroes. Onto the Toa. These are six spirits. Grabbing a cue from the more well known (and successful) Pokemon, each of them is a different element. There is Stone, Earth, Water, Air, Fire and Ice. There also happens to be six Taruga. They each come from a different place on Mata Nui releative to which Toa they worship. Our one is known as Nokama and is the Toraga of Ga-Koro and protector of Gali's legend. (Gali is the Water Toa). Ga-Koro obviously is by the ocean. In fact it turns out to be a floating village made out of seaweed! Our little robot also turns out to be one of the only female robots as well. Oh those masks of power mentioned earlier? Well there are six of them (how handy!) and each one gives its wearer powers like levitation, x-ray vision, speed, breathe under water, etc. Now this isn't all one sided you realise. Makuta, whislt not ever having been seen (well he is a spirit) has a number of "evil" beasts working for him. These you can also buy. Little did I realise when picking up this little bot would there have been so much work gone into a back story that isn't even hinted to on the box. That really is the weird thing about these toys. Sure they look amusing, but someone has figured out a whole island world with villages, history, religion and conflict for something which is more than likely gonna end in lots of bits in the back of a drawer somewhere. (Kids and toys made up of bits do not go well!). However we could well be hearing much more from these little guys and gals (what exactly is the difference between male and female robots anyway?) as they have a computer game coming out on PC and Game Boy Advance soon. If they do well I can just tell a cartoon series is around the corner. Remember, you saw them here first! If you want to check out the impressive (and needlessly detailed) background and world of Bionicles go HERE. No creature that speaks has seen the Makuta and returned. His lair could be in every shadow, every scrap of darkness. Some say he has three heads. Others say he can change into many forms. Only one thing is known for sure: if he is not stopped, his power and evil will grow to dominate all of Mata Nui. The legend says the Makuta is a whirling, kicking, screaming, clawing beast. He--or IT-- could be many things at once - cobra, tiger, hawk. Each must be defeated before the Makuta emerges from deep inside the surface of Mata Nui and replicates into a vicious swarm of seperate and equally deadly beasts. And if this happens, the beings of Mata Nui will know untold harm. So the legend says. Of course what if the legends are wrong? For all we know Makuta will bring in dancing hula girls and Elvis style singers. But legends never have nice things in them now do they?